A free but guilty man, Masamune Dan sought to take back his company, defeat his son, and discontinue those pesky Kamen Riders. Resilient to all strains of the Bugster virus, Masamune was uniquely worthy to obtain the power of the one meant to defeat Gamedeus. With the ability to Pause & Restart, Masamune would become Kamen Rider Cronus! 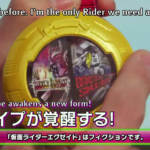 But Taiga Hanaya was the first rider chosen to fight the Bugsters. And as Kamen Rider Snipe he saved countless lives. In order to stop Masamune’s final plot, Taiga exposed himself to Kamen Rider Chronicle and using his Gamer Driver and two Chronicle Gashats, he’ll take on Cronus as, Kamen Rider Cronus!? S.H. Figuarts Kamen Rider Cronus is a bit of a unique release. While we all know Masamune Dan as the menacing Cronus with his ability to control time, Taiga also proved himself worthy of the power near the series finale and would even go on to use this power once more in the Another Ending Trilogy. This figure can represent either version of the suit! While it comes standard with Masamune’s Buggle Driver Zwei, an alternate Gamer Driver with Chronicle Gashats is included as well so to display the figure as Taiga! Will your own Cronus be the hero or the villain of your collection. I’m a sucker and I bought two of them! Thanks to the Gashat Gear Dual Beta, Taiga Hanaya has attained a new level of power! It’s time to simulate some bang bangs, sink some battleships, and give new meaning to what Kancolle is with S.H. Figuarts Kamen Rider Snipe Simulation Gamer Level 50! Snipe Level 50 is now our third outing with this mold and I have to say, it may be my favorite yet. While the new Simulation Gamer armaments may seem bulky and obtrusive, in reality this figure is every bit dynamic to me as the previous two Snipes. Maybe even more so. Snipe Level 50 has gained two new battleship halves in lieu of fists, and two sets of shoulder mounted cannons/turrets to round out his arsenal. These surprisingly articulated parts go along way to selling me on this release far more than I ever imagined. While lite on accessories (just one), Snipe Level 50 is a fantastic addition to any Ex-Aid collection. We’ve attached the full 80 image gallery to this post, but you can also read up on our full length review after the jump by clicking “Discuss on the TokuNation Forums” at the bottom of this post. We’ll be back soon with more new galleries from Kamen Rider Ex-Aid, Kyoryu Sentai Zyuranger, Kamen Rider W, and more! 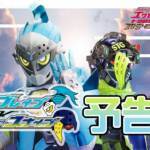 Kamen Rider Ex-Aid Another Ending Part 1: Kamen Rider Brave & Kamen Rider Snipe Trailer Online! At last the fan-favorite Kamen Rider Ex-Aid is returning to screens, with the special ANOTHER ENDING trilogy of films! 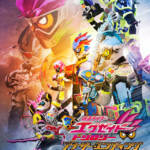 Kamen Rider Ex-Aid Another Ending Part 1: Kamen Rider Brave & Kamen Rider Snipe is currently scheduled for release on DVD & Blu-Ray on March 28, 2018! It took a mighty 4-player Co-Op effort to initially defeat the powerful Bugster Graphite. Using the Level 5 Gashat Drago Knight Hunter Z, Ex-Aid and the other doctor Riders were each granted a portion of it’s power & armor. Thus the Dragon Gun was inherited by Kamen Rider Snipe! Eventually though Taiga would come master the powers of this Gashat on his own. For now we see how well Tamashii Nations has tamed this wild power with a new gallery of S.H. Figuarts Kamen Rider Snipe Hunter Shooting Gamer Level 5! Snipe Level 5 is a mold you’ve seen before. Largely unchanged from the original Snipe Level 2 release, Level 5 swaps out the left side limbs for the Drago Knight Hunter Z armor, granting Snipe the powerful Dragon Gun. While these parts are largely unchanged from their outing with Ex-Aid Level 5, Snipe can make full use of this arms’ articulation unlike Ex-Aid. This go around we also have the inclusion of 7 unique word bubble effect parts to spruce up your Ex-Aid display or a battle scene! A few of which are different from those included with Brave Level 5, whom this figure pairs perfectly with. We’ve attached the full 60+ image gallery to this post, but you can also read up on our full review of this figure by clicking “Discuss on the TokuNation Forums” at the bottom of this post. We’ll be back soon with a new gallery from Kamen Rider W! We have an update from our site sponsor BigBadToyStore.com! Check out the latest toku new arrivals and pre-orders listed below. At the end of the post you can find the full, latest newsletter by clicking “Read More”. Don’t forget – BigBadToyStore.com has recently updated their entire set and made it even easier to find your favorite toys and collectibles – check it out! Don’t forget to take advantage of the new Pile of Loot system, where a flat rate shipping fee can save you hundreds of dollars in shipping. You can also pick and choose which items out of your Pile of Loot you want to ship now or want to ship later! Check out BigBadToyStore.com today! The disgraced unlicensed doctor Hanaya Taiga had a chance to defend the world 6 years ago. But his failures kept him from being the Kamen Rider he should have been, and made him the anti-hero he is today. Rounding out the finale of our special 3 part gallery breakdown of the Migthy Action X Beginning Set is our gallery of S.H. Figuarts Kamen Rider Snipe Shooting Gamer Level 2! Snipe Level 2 takes what worked with the new Ex-Aid body on the first two figures and continues that reliability. While the Snipe design may not be my personal favorite of the 3, this is a solidly made release that brings a few new things to the table. Namely a new shoulder sash assembly (that does not work well), a gorgeous head that does work and uses one clever trick, and his trusty sidearm the Gashacon Magnum. An extra part is included to transform this weapon to it’s Rifle Mode as well. We’ve attached a selection of images to this post but you can check out the full gallery & review of S.H. Figuarts Kamen Rider Snipe Level 2 after the jump. Just click “discuss on the TokuNation Forums” at the bottom of this post! And that rounds out our 3-part look at the first releases from Kamen Rider Ex-Aid! We’ll see you soon for another exciting gallery!